The first post on Jonah Hill’s Instagram, dated March 14th of this year, sets a clear tone: The young stallion in a black tank top, a gold chain and the hint of a tattoo on his forearm peeking out of the bottom of the frame. He’s looking into the viewfinder of a large movie camera, like a true auteur. “I am a man, and I make art,” the picture declares. What Hill has accomplished in the last two years is a remarkable feat of personal branding. He’s successfully twisted his image from “funny fat kid in Superbad” to downtown art and fashion maven. What we like and what we choose to consume is, as it always has been, an indicator of who we are and who we want to be — doubly so for our appreciation of celebrities. (An unhealthy percentage of my bathroom time is spent looking at paparazzi photos of Hill, Justin Theroux and various basketball players and analyzing their fits in order to figure out how to dare touch the face of the style gods.) Hill, though, represents something very specific: the young man easing into adulthood, and feeling comfortable about it. That adulthood, however, comes with caveats. He exists in a state of in-between, being both the funny kid from Superbad, but also the kind of guy who walks around big cities in the opposite of traditional menswear: nothing more complicated than sneakers, a trenchcoat and a pair of crisp Dickies. A lit cigarette and a perspiring iced coffee make his look mildly rebellious, but they’re also signifiers that he’s on the way to a meeting, or something. Whatever it is that men aspire to be in 2018 — independent, forever youthful, but also busy and rich — can be found in the average Jonah Hill pap photo. At first, saying that Jonah Hill was a stylish guy was something of a punchline, a way to get a reader’s attention as they scrolled through their various feeds. The breathless headlines rained down on the internet late last year: “Jonah Hill Is Our New Style Savior,” GQ declared. 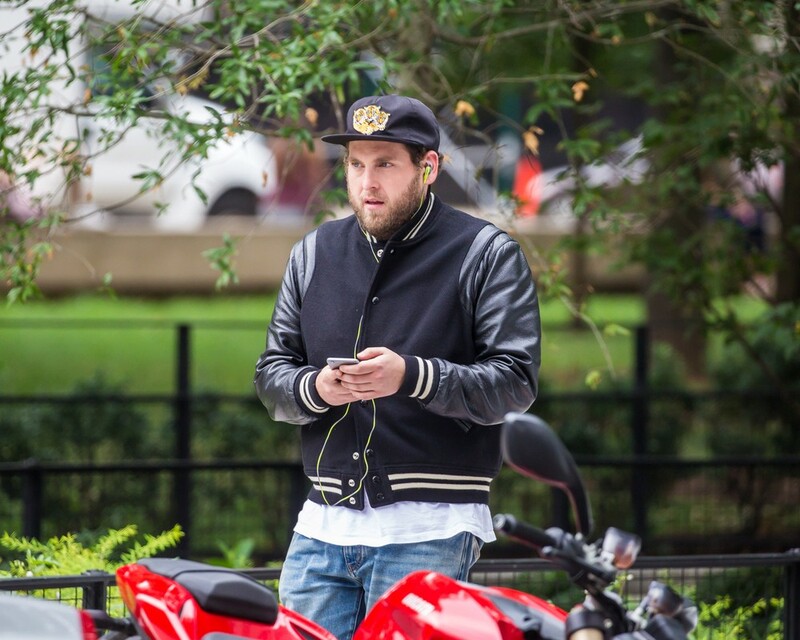 “Jonah Hill is the Legit Ambassador of Streetwear,” Highsnobiety promised. Most of these blog posts are accompanied by photos of Hill dressed like either a low-level Russian gangster or just, like, wearing an expensive T-shirt. Occasionally, those shirts will bear the logo of the U.K. skateboard brand Palace. Fashion Twitter accounts like Four Pins dedicate post after post to appreciations of his looks and have crafted a galaxy of memes to pay homage. This isn’t to say Hill doesn’t deserve credit for dressing well. He does, but it’s curious why this particular individual has encouraged countless style writers to spray paint their affection for his aesthetic whenever possible. Hill’s Instagram posts with Spring Breakers director Harmony Korine, who derived much of his creative inspiration from Manhattan’s downtown skate scene, double down on this. Skateboarding is slowly replacing the motorcycle as the go-to for men hoping to stave off the effects of aging. It’s a young man’s game, a culture cultivated from suburban malaise and fresh-faced indiscretions. Physical danger and nonconformity are inescapable parts of the package. Though skating has come a long way from its truly lawless days in the 1970s and 1980s, it remains a subculture notorious for rejecting outsiders and frowning upon mainstream appropriation. But skateboarding isn’t what we think of when we think of Jonah Hill, even if that’s what he wants. It’s hard to shake a first impression of a celebrity, doubly so when that first impression involves weight. Our collective memory of Hill as a child is a filter through which we perceive everything that he does. He was the “fat kid” in 40-Year-Old Virgin, the “fat kid” in Superbad and the “fat kid” in Knocked Up. He’d gain the weight back for roles in films like War Dogs and The Wolf of Wall Street, his weight constantly yo-yo-ing thereafter, though it’s hard to tell if that’s for roles or not. The ability to transform and to improve is surely very seductive for those looking to celebrities for inspiration and/or for sexual gratification. It’s the classic “zero-to-hero” narrative that fuels great teen comedies like Superbad. Plus, it’s heartening to think that a major life change could occur so quickly, that a little “Japanese food” and no beer is the key to a happier existence. The clothes are almost extra compared to the power of self-improvement. Of course, one could wear all of the same clothes as Jonah Hill, casually smoke cigs on the way to the gym or opine on legendary kick-flips, but none of it would matter without the perceived magic that comes with celebrity. A dusting of fame changes everything. He can now bless your particular obsessions and show you the way to elevate yourself beyond whatever mundane cliché it is you feel you’re stuck in. He can be fat or be not-fat. He can wear shorts with an overcoat. The freedom that’s there, even if it’s hardly transgressive, is potent. That said, it’s illusory. There’s a camera capturing the moment. There’s people like me dissecting it. We obsess over the garms and wonder what’s next. Can he keep up? Will the novelty fade? Heavy is the head that wears the fashion crown.